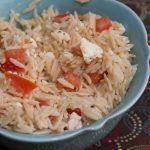 Orzo Salad with Tomatoes and Feta. An Easy Side for Lunch or Dinner! I love easy pasta salads I can make in a snap! This orzo salad is super simple and takes only 20 minutes to make from start to finish. This orzo salad is so simple but delicious! It makes a great side for a variety of dishes, especially chicken dinners. Normally orzo is used in soups but this salad turns it into a cold, savory side. The feta gives it that salty bite and the cherry tomatoes are sweet. 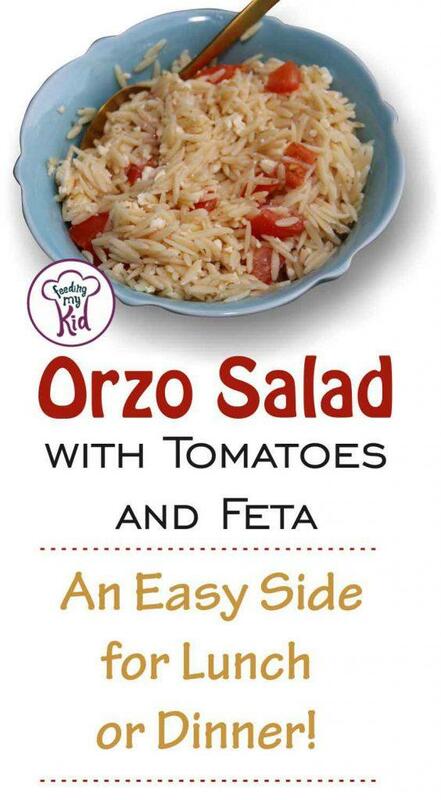 You’ll love this orzo salad and so will your kids! This is a great dish to introduce your kids to new flavors like salty feta and cherry tomatoes. They’ll love the “miniature” aspect of the cherry tomatoes! This easy orzo salad combines salty feta cheese with fresh grape tomatoes. Super easy and goes great with a ton of meals! Cook orzo according to package (about 10 minutes.) I like to submerge my orzo in an ice bath for about 5 minutes to stop the cooking process and get it nice and cold. Drain the orzo when it's done cooling and let it sit for a couple minutes, making sure all the water has been drained and it's pretty dry. Add in the halved cherry tomatoes and the 1/4 cup feta. Give one last mix and serve cold. Enjoy! This side dish goes well with chicken, fish, or anything Italian! Next articleEasy Bruschetta Recipe You Can Put on Anything!